Since, this film doesn't have anything remote associated with term "Plot". Let me draw an analogy which can explain things. In my school days, I was very bad at drawing (I still am). When my teacher asked me to draw an elephant, I drew something which looked like a malnourished dog suffering from leprosy and polio. Teacher gave me repeat and asked me to try better. In my 10th attempt, I could remotely draw a mutant version of elephant. In a nutshell, that is the story of "Baar Baar Dekho" in which Siddharth is trying to fix his life. I wish Siddharth takes this inspiration to his real life and try to fix his choice of films and acting skills as well! This film is directed by debutante Nitya Mehra, known for being an assistant director in The Namesake, Life of Pi and Reluctant Fundamentalist. Yes, my jaw dropped too after knowing this information. As per latest information, Mira Nair and Ang Lee haven't disowned her yet. We will let you know as and when it happens. Sidharth Malhotra is a mystery which I haven't been able to resolve yet. Such incompetent nincompoops are usually star kids who play with Bollywood films like soft toys. But, he is a self made man (or that is what media says). How on earth is he surviving? KJo ne usmein aisa bhi kya dekh liya? He is absolutely horrible in the film. Neither he takes his lines confidently, nor he can emote at all. He would wake up from sleep and look at back of his palm and estimate his age. Katrina Kaif plays her usual self and speaks Hindi in her fake British Hong Kong accent. Talented cast of Ram Kapoor, Sarika and Rajit Kapoor is totally wasted in the film. I was surprised to see Rohan Joshi (AIB Team) doing a menial role in the film. My friendly advice to him - He would rather lead to his brand erosion with such disasters. Music by Amaal Mallik, Arko, Badshah, Jasleen Royal and Bilal Saeed is melodious and clap-worthy. It has a nice variety of moods - Kala Chashma (Dance number), Nachde ne saare (Family masti), Sau Aaasman and Dariya (Romantic). Cinematography and Principal photography is top notch. Shooting was done in Glasgow, Scotland and Krabi, Thailand. Even the futuristic scenes were conceptually convincing with VFX. I personally liked the message film wanted to convey about creating a balance. But, unfortunately it couldn't convey it in an entertaining and convincing way. Verdict: There can't be one good reason to watch this film. You should rather watch Kala Chashma and other songs on YouTube, which would be more entertaining. 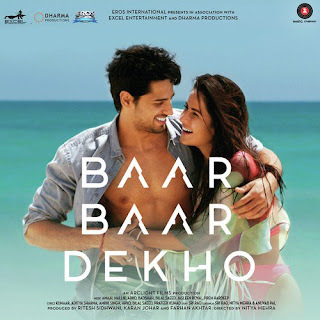 Baar Baar Dekho music album is a good hit but film is a disgrace to Bollywood.